In the short term, construction defect litigation may affect the value of your home or condo. However, the construction defects themselves reduce the value of your home or condo, and in the long term, obtaining compensation through litigation and repairing defects should increase the value of your home or condo. 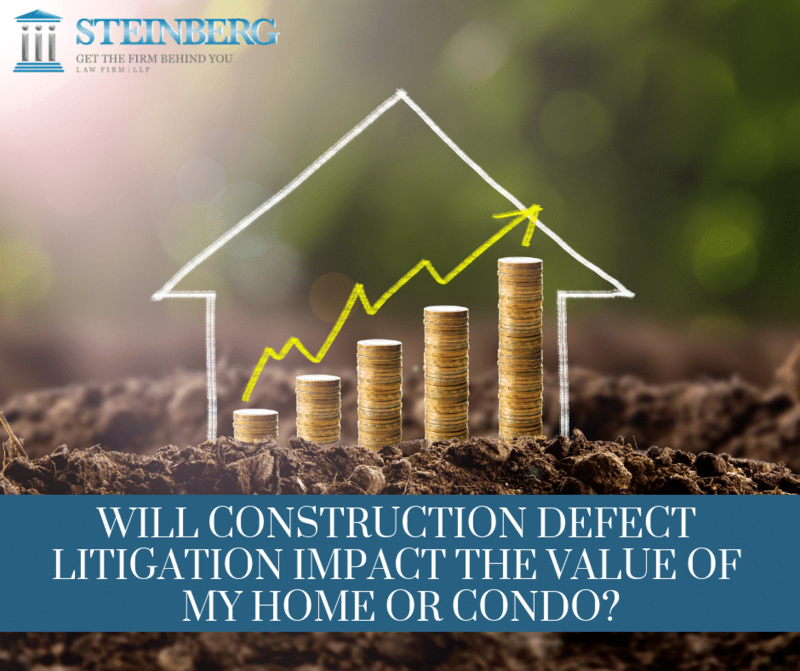 Like any litigation, construction defect litigation is a significant event, and while the litigation is ongoing it may impact whether a potential buyer is willing to buy your home and how much they are willing to pay. That impact should only last as long as the suit is ongoing. However, you should always be prepared for litigation to be a long, slow process. The impact of the construction litigation while it is ongoing is no different from any other litigation. If your house burns down and you have to sue the insurance company to get compensation, the value of your property is going to be significantly less until you get compensation to rebuild your home. In the long term, a construction problem will negatively affect your home or condo until the problem is repaired. Ignoring a construction problem will not make it go away and will only allow it to worsen over time. Attempting to sell your home without fixing the problem and without telling the buyer will not solve the problem. Most buyers engage a home inspector to look at a home prior to purchasing it, and home inspectors often uncover construction problems in homes. Even if the home inspector does not catch the problem, a person who sells a home or condo without telling the buyer about known problems in the home may be liable to the buyer under South Carolina law. Given all of that, the only real option for a homeowner with construction defects is to seek compensation from the builder. The builder is the one who did the bad work, who did not do what the law requires, and who caused the damage, and the builder should have to compensate the homeowner for any impact on the value of the home or condo. Construction defects are certainly different from personal injury cases both because the damages are different (property damage versus injury to the body) and because construction defects usually appear slowly over time without the extent of the damage readily visible. If you are injured in a car wreck, it is an unfortunate event that you did not deserve and that you should not have to spend time out of work and in the hospital addressing. The same is true with a construction defect. You should not have a house with construction defects and you should not have the value of your home, your biggest investment, negatively impacted by a construction defect. However, it happens, and the best way to move forward is to hire an attorney focused on construction defect claims to go after the builder for compensation. If you believe your home has structural defects, contact the knowledgable attorneys at the Steinberg Law Firm today. We will fight tirelessly to get you the compensation you deserve. We are here to help you and the initial consultation is free.